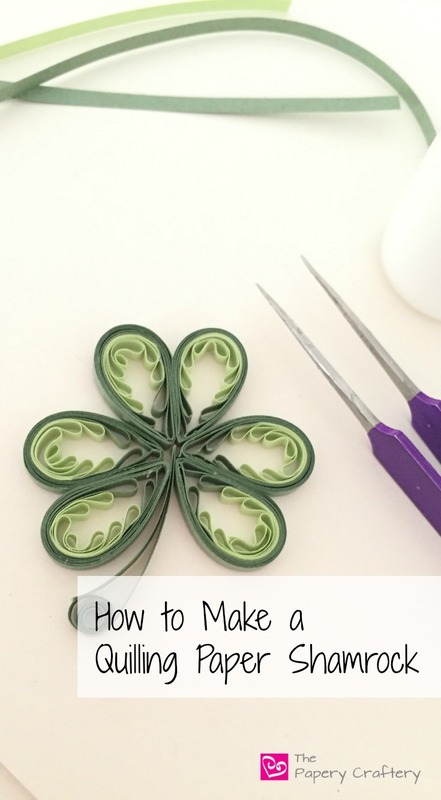 With on of my family’s favorite holidays, St. Patrick’s Day, coming up, I thought I’d take create a tutorial for how to make a quilling paper shamrock, but with a twist. Instead of the straight-forward clover leaves formed from teardrop coils, I went a step further to design my shamrock to be built on a quilling comb. I also decided to use two colors of green quilling paper, a pale celery green and a deeper leaf green. The only other supplies needed are some glue, a needle tool, and a cork work board, covered in wax paper. I find having some tweezers and pins handy can make the process easier, but they aren’t absolutely necessary. To start quilling my shamrocks, I used strips of celery paper with a width of 1/8″. Only about 5 1/2″ of the pale green are needed for each section, but when working on a quilling comb, having a longer length than needed makes the weaving movements smoother and more effortless. Starting on a middle tooth of the comb, I fold one end around a tooth so it very slightly overlaps the rest of the strip. This small tab will be held in place with one hand while the longer end is woven around the teeth on either side of the starting point. To get the shamrock to the size I wanted I made 7 loops of the pale green. After the seventh loop, I tear the excess paper from the strip, and, using a little dot of glue, I attached the tail to the back side of the loops. At this point, its pretty much the same exact process that I use to create my flower bud gift tags. Next, I start weaving the darker green. I start with a torn end and attach it right where the pale green strip left off. Once dry, the darker green can be woven in the same way as the first color; one loop alternating sides. Four loops total are needed; two on each side. About 7 inches of leaf green are needed for this step for each section of the leaf, but again, leave yourself some extra length to work with. After the four loops are made, tear off the excess and glue to secure to the back. After a few seconds, the glue on the loops will be dry enough for the quilling paper to be pulled from the comb. I use a very small dot of glue to keep the small tab of pale green down in the center. Next, I bring the two outside loops together with the pale green loops on the inside and glue together. This will form a drop shape that will be one half of a leaf. To keep the leaf looking finished and polished, I used a strip of 6″ of the darker leaf green quilling paper to wrap around the drop shape about 3 times. This also helps to make the drop more sturdy and strong. Repeat this process 6 times to get enough drops to make a full shamrock. To create the heart-shaped leaves, simply glue two drops together. A few straight pins may help keep the drops together while the glue is drying. Once the two halves of each leaf have dried, position them as you like and use a little more glue to finish! If you’d like to use this technique to make a good luck 4 leaf clover, simply make another two drops on your quilling comb to create the extra leaf. They won’t join perfectly in the center of the clover, but I think I solved that problem pretty easily with a small coil. When you’re happy with your shamrock leaves, add a stem. And, there you have it! The finished shamrock measures about two inches from side to side, but go ahead and make it larger or smaller to suit your needs. They’d be adorable on some gift tags or to dress up your St. Patrick’s scrapbook pages. Let me know how your quilling comb shamrocks turned out! Leave me a comment to tell me how you used them for your celebrations, and Happy St. Patrick’s Day! I am trying to find a pattern for a St Patty’s day art project with my craft group. I saw a really cute one on Pinterest that looks like it was for sale on Etsy. Might you be the originator? If so, would you be interested in sharing your pattern and instructions? Hmmm, It doesn’t sound like it’s mine, Jody. The only shamrock I’ve shared is the tutorial on this page. Sorry that’s not much help!